Oxygen carts, also known as cylinder carts, are designed to transport life-sustaining oxygen cylinders and canisters from one area to another. If you or a loved one depend on an oxygen tank, you are well aware of how cumbersome it can be to carry them in a bag or by hand. Purchasing a rolling oxygen cart, in either a single or dual-size capacity, can provide a new lease on life for its users. Indeed, oxygen tank carts are available in different sizes and configurations, with some of them even featuring a basket style holder. Users that we spoke with love that these rolling oxygen cylinder carts provide a new lease on life- allowing them a greater range of movement. Let's take a look at 5 of the best-selling models on the market today and see how they compare. This portable dual oxygen cart with wheels offered by Drive Medical is light, well-made and convenient. Users love the color and the price, but some do note that the wheels wobble. This oxygen tank cart has a silver vein finish, an adjustable handle, two wheels and it’s suitable for “D” and “E” sized oxygen cylinders. Overall, this is an excellent choice for anyone who needs an inexpensive wheel rolling oxygen carrier, but you should be aware that the package doesn’t include an oxygen tank. As a whole, customers are extremely satisfied with the functionality, usefulness, and stability of the Drive Medical portable oxygen cart. A customer shares that this oxygen cart is well-balanced, well-designed, and easy to navigate and that he would recommend it without a second thought. Another buyer mentions that this oxygen tank stand is well-constructed and more solid than he expected and he highly recommends it. A happy purchaser comments that it’s easy to adjust the handle to the height you desire and that the tank fits securely. The reviewer also says that it’s easy to store the oxygen cart away when you don’t need it. However, some customers have complained that the wheels are cheaply made, and they fell off after a couple of days. A user complains that there is no way to tighten the wheels and the whole construction is not as sturdy as he expected it to be. This two cylinder oxygen cart offered by Responsive Respiratory is stable, practical and well-designed. Users love the dual capacity feature, but some do note that it’s heavier than they expected. This portable oxygen rack has an ultra lightweight design, an adjustable handle, a durable silver paint finish, plastic wheels, and a weight of approximately 6 lbs. You can use this oxygen tank storage rack both for “D” and “E” cylinders, but they are not included in the package. Overall, this is a great solution if you want to have an extra oxygen tank available, but it has several shortcomings. As a whole, customers have mixed feelings regarding the Responsive Respiratory dual oxygen cylinder cart. A buyer shares that he is very pleased with the stability and lightness of this dual oxygen tank carrier and he doesn’t have any problems to push it around. Another happy user mentions that he can afford to go on longer excursions since he has two tanks available, but he states that it’s difficult to lift the oxygen tank rack in and out of a vehicle. A purchaser also mentions that the two cylinder oxygen cart is extremely convenient, but he notes that it’s not as sturdy as he would have liked. Some other customers have complained that it’s difficult to pull the oxygen carrier around and that the plastic wheels won’t hold up well in the long run. This adjustable single oxygen-cart offered by Drive Medical is portable, light and a product of high-quality and price. Users love the light construction and the compact size, but some do note that it’s not what expected. This oxygen tank carrier has an adjustable handle, large plastic wheels, a weight of approximately 2 pounds when empty and it’s made of chrome-plated steel. It can accommodate only one oxygen tank – size “D” or “E”, and it’s easy to roll it around. Overall, this is a good product if you need something reliable and stable. In general, users agree that the Drive Medical oxygen cylinder rack is convenient, useful and well-built. A user comments that this oxygen tank stand is sturdier than he expected and it’s easy to navigate and store it away. The reviewer also states that it’s perfect for a dental or a medical office and he would recommend it to anyone looking for a high-quality portable oxygen tank cart. Another buyer mentions that this adjustable oxygen cart makes his life easier and it’s so compact that he can put it in the back of his car. However, some customers were disappointed that the oxygen cart is not suitable for smaller tanks and they had to return it. A user also complains that the product he received had black wheels instead of white and it looked cheap. If you are looking for a top rated oxygen storage rack, you could take a look at this oxygen cylinder tank holder. Users love the high-quality design, but some do note they had some wheel problems. This medical oxygen cart is available in two versions – single and dual. The single oxygen cart has a weight of 10.8 pounds, a silver vein finish, two 6-inch wheels, which are easy to maneuver, and it holds only one “E ”size oxygen cylinders. The dual oxygen tank cart also has a silver vein finish, an adjustable handle, two large wheels and it can hold two “D” or “E” oxygen tanks. A buyer comments that it took him less than three minutes to assemble the duel oxygen cylinder rack and that he was extremely surprised by its light, but sturdy construction. The reviewer also states that he can load the rack in the car easily because of the middle handle. Another reviewer mentions that this oxygen tank holder is much more convenient than a shoulder bag and he likes the silver finish. A pleased user also says that the construction of this tank carrier is very durable and it can hold the weight of two oxygen tanks without bending. However, some customers have complained that the wheels don’t roll as easily as they should and it’s uncomfortable to move it around. A user also complains that the handle doesn’t slide. This portable oxygen cylinder carrier offered by Crammer Decker is a light basket-style option. Its comfortable to wheel around and an excellent choice for anyone that needs an oxygen rack. Users love that it’s very easy to assemble the cart, but some do note that it’s expensive. 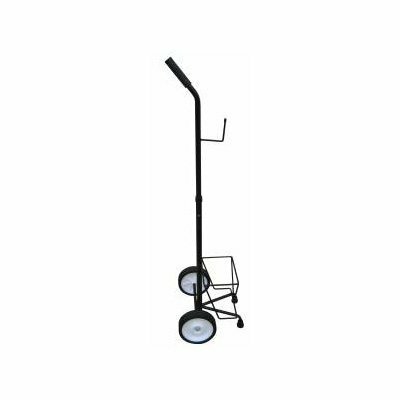 This liquid oxygen tank cart has a durable black powder finish, lightweight construction, solid wheels with an easy-to-clean surface and a basket with a size of 7.5″ x 5.3″ x 7″. You can also adjust the height to make it more convenient for you, so this could be a nice alternative for caring your oxygen tank. As a whole, users are extremely satisfied with the design, sturdiness, and usefulness of the Cramer Decker oxygen cylinder rack. They also don’t have any major complaints regarding this oxygen stand. One buyer mentioned that her mother found it difficult to carry her oxygen tank in her bag and this portable oxygen rack was the perfect solution to their problems. The reviewer also states that her mother’s life is easier since they got the liquid oxygen cart and she is very pleased with her purchase. Another user also comments that her oxygen tank fits perfectly in the basket and the oxygen tank rack is so light that she doesn’t have problems to put her in her car. Another happy customer shared that he was surprised by the sturdy construction and that it was easier to roll the cart around than he expected. He would definitely recommend it to anyone looking for the best cylinder stand for oxygen tanks. One of our favorite mobile oxygen tank carriers is produced by Drive Medical- it weighs 4.3 pounds and is equipped to fit 2 D and E-sized oxygen cylinders. Users that we spoke you provided nearly unanimous positive feedback for this rolling oxygen tank carrier. One buyer purchased it for a relative suffering from COPD- she says that her sickly relative had gotten used to carrying her oxygen tank around in her arms whenever she went anywhere in this became extremely cumbersome for her. After purchasing and setting up this Drive Medical oxygen tank carrier, now she and the relative can travel much more freely, without her hands being encumbered by lumbering around with a bulky oxygen tank. Another user told us that this oxygen tank carrier is a well-constructed option that is properly balanced and is easy to wheel around. Yet another buyer we spoke to had purchased for this two-wheeled oxygen tank carrier for a friend suffering from cancer. Her friend had been hauling around the oxygen tank in a bag, but that was way too heavy for her to do on a daily basis. Another buyer praised how light weight and stable-feeling the drive medical two-wheel oxygen tank carrier is. Another buyer spoke of purchasing this Drive Medical oxygen cart carrier for an elderly relative that required oxygen 24 hours a day seven days a week. What they really liked about it was that the handle adjusts to your or your loved ones height requirements- as well, it's pretty easy to do the adjusting. The Responsive Respiratory two cylinder oxygen cart is a little bit different than the Drive Medical option because they can actually hold two oxygen cylinders in as opposed to one. The manufacturers say that it is designed to be particularly lightweight and easy to handle, the adjustable height handles and a durable paint finish of silver powder coat. One satisfied buyer told us that this was a great solution for them because they needed an oxygen cart carrier that had an extra tank capacity. On account of its 2-oxygen tank capacity, this buyer told us that he has a bit of a longer leash- he's able to travel farther and do more things knowing that he has a back up tank available to him. Another buyer told us that while he appreciates the design, he says that it is difficult to lift in and out of the car when the tanks are inserted into the carrier. Another buyer cautioned us, saying that the cart is poorly constructed. He said that the plastic wheels are just not sturdy and functional enough to bear the weight of the two tanks. There is an issue of balance, he says, that when you try to lift the cart and put it in a car, or some other space, it doesn't feel balanced as you do so, making it difficult to maneuver in those situations. However, one home care facility we spoke to told us that they had been fruitlessly looking for a two oxygen cylinder cart, but had been unable to find them in local retail stores, until eventually they resorted to an online search and found this particular model. Other buyers told us that it weighs around 7 to 8 pounds and there is a hook on the back for the O2 line to be held when not in use. Another Drive Medical option we examined was their single oxygen tank model- its handle height is adjustable about 6 inches, but the wheel and base height are not adjustable. One buyer we spoke to said that it is a sturdy cart, but he said that it would not duplicate the functionality of a cane. Another buyer told us that it was welded very durable way, has nice wheels, though one buyer said he would've preferred rubber wheels instead of the hard plastic ones that this oxygen cart came with because they would be quieter and probably handle better. Other buyers say that it is a solid and basic oxygen tank cart that allows their elderly relatives the ability to go into their gardens and in general remain active, and no longer have to carry their oxygen tank wherever they go. The Oxygen-Accessories single-cylinder cart weighs 10.8 pounds and is designed to hold E oxygen cylinders. Buyers we spoke to said that it is a sturdy and lightweight option that is easy to assemble in around three minutes, with the oxygen cylinders themselves securely locking into the cart. One feature buyers heartily endorsed is that it has a handle in its middle area so that it is easier to load into the car than other models we have examined. It comes in single and dual sizes- so when you look to check out, make sure that you have selected the tank capacity that's right for you. One buyer we spoke to said that purchasing a duel oxygen cart was necessary because he world work a traditional eight hour day he found that he required two E-tanks a day to get through his workday. Another thing a buyer told us about the dual cart is that it really doesn't take up a larger footprint than the single-sized oxygen cart. Another buyer we spoke to had very large oxygen requirements, eventually ranging from 10 to 15 liters per minute (LPM) when he is outside. He was highly satisfied purchasing the two-tank option because even though it weighed a lot more it gave him considerably more freedom. The Cramer Decker liquid oxygen cart was another option that we examined-it ships with a black powder coat finish, is adjustable to different heights, and features a basket design. Users, in general, were pretty satisfied with this portable liquid oxygen cart, saying that it is well constructed and the basket was ideally sized for small portable oxygen concentrator's and liquid oxygen tanks. We would be remiss if we didn't touch on the best way to safely store oxygen cylinder tanks- it's always best to keep them in an upright position, completely secured inside the oxygen cart, so that they are kept stationary and do not fall or tip over. Another handy tip- make sure that you do not store them inside of small closets, boxes or lockers, because if they begin to leak, there is the potential that a deadly flammable build up will occur. It's therefore essential to keep them stored in well-ventilated and dry areas, far removed from combustible materials. 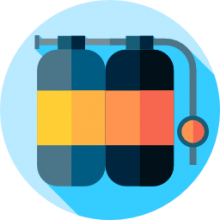 In general, you'll want to keep your oxygen cylinders stored in environments where they will not be subject to mechanical, heat or physical damage to prevent the possibility of an explosion.